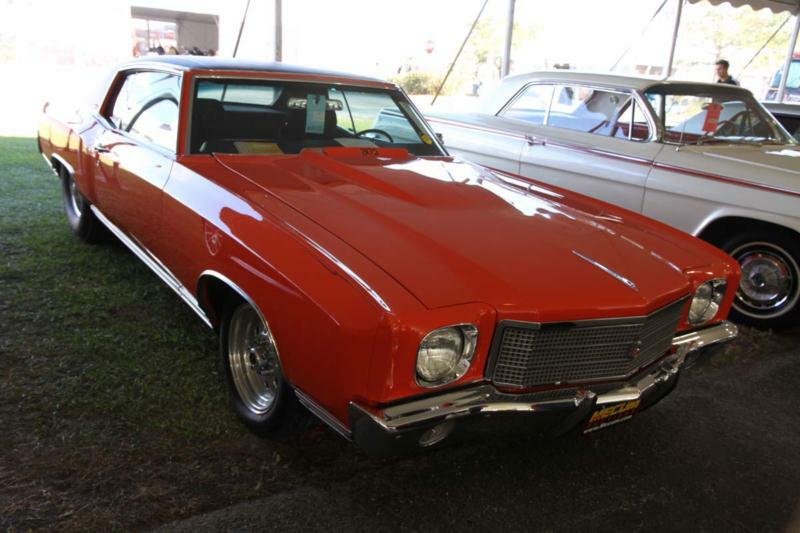 The Monte Carlo was originally conceived as Chevrolet’s counterpart to the new “G-body” Pontiac Grand Prix, which was a great success in 1969. Pete Estes and Dave Holls raided the GM parts bin; much of the body and structure came from the Chevelle, but the styling of the contemporary Cadillac Eldorado also showed through with a long hood, wider C-pillars and muscular fender bulges in the rear. Despite a labor strike in Flint during the early months of 1970, GM cranked out more than 159,000 Monte Carlos, most with the familiar 350 small block V-8 mated to a column-mounted three-speed Synchro-Mesh transmission. The “SS 454” was the top-of-the-line performance package available, although they accounted for less than 3 percent of the Monte Carlo’s production that year. 1971 saw only modest styling upgrades. Changes included new interior knob symbols, a four-spoke steering wheel, and a new “stand-up” hood ornament. 1971 was also the year that Chevrolet began rating horsepower by both gross and net, and lowered compression ratios to allow the use of unleaded fuel across the board. This occurred as both Ford and Chrysler ended their factory-backed NASCAR teams, so the long-wheelbase Monte Carlo (116 inch) suddenly became racers’ choice for the new independent NASCAR racing teams. In 1972, the Monte Carlo received an “egg crate” grille-styling similar to the Caprice, and additional rear trim molding. 1972 was also the final year for the 1st generation design, and the last year of the SS option package. Variable-ratio power steering became standard equipment, and the four-speed manual transmission option was deleted. The Monte Carlo was moving away from a performance car and into the personal luxury vehicle market.